Since management of Canada’s energy resources has become a major economic issue in this election, I thought it would be useful to review how Norway and Canada—both major producers and exporters of petroleum (oil and gas)—go about it. Spoiler alert: Norway manages its energy resources much better than we do. A glimpse at the major differences in approach shows us why. Keep reading for more detailed analysis. Both Canada and Norway produce roughly the same volumes of oil and gas. Norway is the worlds 6th largest exporter of oil and the 2nd largest exporter of gas. It exports 90% of its oil production, and 90% of that goes to EU countries. Canada is the 9th largest oil exporter and 4th largest gas exporter. It exports almost two-thirds of its production, and virtually all of that to the U.S. Canada is also a major importer of oil—equivalent to 55% of its exports. In Canada, petroleum production and transportation infrastructure is 100% owned by foreign and domestic private companies as well as foreign state-owned companies, including from China, France, Korea, Malaysia and Norway and Thailand. Publicly owned Canadian companies—Petro-Canada and Alberta Energy Corporation—were fully privatized in the 1980s and 1990s. Alberta lowered its non-petroleum taxes as petroleum revenues rose, to the point where it now has by far the lowest overall taxes in Canada. This put pressure on other provinces to lower their taxes as well. Canada’s tax-to-GDP ratio fell from 36% in 1998 to 31% in 2013—representing a massive cut to governments’ fiscal capacity. Since the mid-1990s, the Norwegian tax rate on petroleum company profits has been 78%. Both the Canadian and Alberta government lowered general corporate income taxes, including on petroleum companies, over the last 15 years. Since 2000, the federal rate was cut from 28% to 15%. Net of subsidies, the effective federal tax on petroleum companies is about 7%. The Alberta corporate income tax rate was cut from 15.5% to 10% between 2001 and 2014. Norway realized revenues of $87.69 per barrel of oil in 2013 while Alberta took in only $4.38 per barrel— one-twentieth what Norway appropriated. The Canadian government captures a very small portion of this surplus through its 15% federal corporate tax rate. 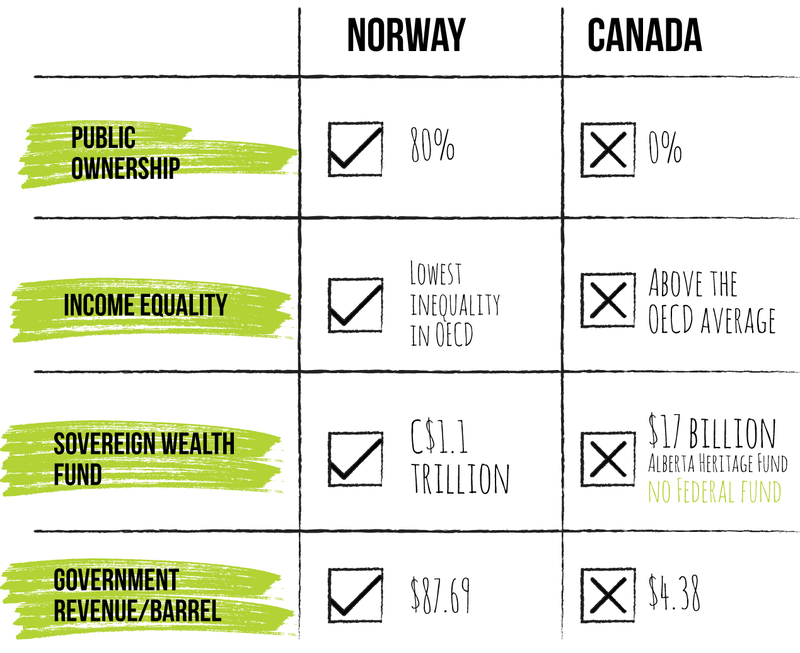 Petroleum wealth is equitably distributed giving Norway one of the lowest levels of income inequality in the world. It also has one of the most generous social welfare systems. Since the mid-1990s income inequality in Canada has grown rapidly, driven by the richest 1%. It is now above the OECD average. Social programs have been cut. Interprovincial income disparities have grown. Reduced federal-provincial transfers have exacerbated these disparities. Income inequality within Alberta is the highest in Canada. Norway set up a sovereign wealth fund in 1990 to save a portion of its petroleum revenues for the benefit of current and future generations. It now holds C$1.1 trillion, making it the world’s largest sovereign wealth fund. Alberta established its Heritage Savings Fund in 1976, but it contains only $17 billion. The federal government has no sovereign wealth fund and no plans to establish one. The Norwegian government’s fiscal capacity is cushioned from price swings and fluctuating petroleum revenues due largely to its petroleum wealth fund. All petro-revenues are placed in the Fund then invested abroad. Only the return on Fund investments—4% long term—is remitted to government coffers. The government can take a higher percentage to cover a larger than anticipated revenue shortfall, ensuring that the budget is always balanced. The Alberta government is highly dependent on petroleum revenues for current expenditures, which go up and down as oil prices fluctuate. Its practice has been to cut spending during downswings, exacerbating the negative effect on the economy. Alberta’s small sovereign wealth fund is not able to cushion the impacts of falling petro-revenue in the same way as Norway. This year, the Alberta government’s deficit is estimated to be $6 billion. The federal government’s budget has been in deficit since 2008 and only achieved marginal surplus 2014-15 thanks to massive cuts in public services. By cutting non-petroleum taxes, the government has become more dependent on petroleum and other resource revenue. The oil price collapse has almost certainly pushed the federal budget back into deficit. Norway has maintained a stable exchange rate with its main trading partner, the EU, due largely to its sovereign wealth fund’s ability to manage inflows and outflows of petroleum revenue. In Canada, the petro-led resource boom caused a dramatic rise in the Canadian dollar—from 62 cents U.S. in January 2002 to parity in 2007—with major adverse impacts on non-petroleum regions of Canada, as reported by the OECD. Since the 2014 oil price collapse, the dollar has fallen to 75 cents U.S.
Norway has maintained a huge trade surplus since the mid-1990s. Since the 2008 recession, Canada’s overall goods and services trade has been in deficit. Its non-energy goods trade deficit is massive. The oil-led resource boom resulted in a dramatic shift in the composition of Canada’s trade, with unprocessed and semi-processed resource exports now accounting for almost two-thirds of Canada’s total goods exports. High-value-added finished products have dropped to one-third of exports from almost 60% in 1999. Norway has maintained virtually full employment (4% or less) since the global economic meltdown and thus far into the 2015 despite the oil price collapse. Canada’s unemployment rate has remained high since 2008 (currently around 7%). While Alberta’s unemployment rate has been lower, it jumped from an average of 5.4% from 2009-2014 to 6% currently. Bruce Campbell is the executive director of the CCPA. He travelled to Norway to better understand the “Norwegian Model” and summarized his findings in the 2013 CCPA report The Petro-Path Not Taken. Hello Bruce, I think this is an excellent breakdown of the differences in management. What a shame that Canada has not followed suit. I am curious about something please. What would be your response to that please? Thank you! The Alberta Heritage Savings Fund was established in 1976. It had a 20-year head start during which time almost all oil and gas produced was conventional. The Norwegians did not start contributing to their fund until 1996. They have been contributing to it for 20 years, while Alberta has had 40 years to contribute. I have not done the calculation but would bet that Alberta has over that period produced significantly more conventional oil than Norway. Yes, the oilsands have required major investment and is more costly to access. But that does not come close to explaining the gap in the economic surplus appropriated by the two countries’ governments. Remember also, all Norway’s petroleum is offshore and has required significant technological challenges, investment and expense to access. On the question of federal-provincial jurisdiction, here’s an excerpt from my report. “The Canadian constitution (with some exceptions) assigns ownership of petroleum and other natural resources to the provinces, giving them sub¬stantial control over the nature and pace of oil development. However, the federal government has economic (interprovincial and international trade) and environmental regulatory powers that affect the nature and pace of oil development. It is also responsible for climate policy due to the extra-provincial — indeed global — impact of car¬bon emissions, and as such has responsibility for signing and enforcing cli¬mate treaties. Look, the Alberta government and the federal government, both duly elected, made there choices, the consequences of which are clear as I have tried to demonstrate with this brief article. Ridiculous article – how, exactly, does Norwy continue to derive $87.69 a barrel in revenue from oil when the world price is roughly $45 a barrel. If you’d read the article, you’d have noticed the revenue figure was from 2013. The problem is the Alberta government did not leave the money in the hands of the citizens. It gave the majority to the oil companies, many of them foreign companies. Right wing ideology triumphed over common sense. One of the things that helped Norway profit so successfully was state ownership. If you look at the numbers it is an astronomical difference and can not all be explained by the cost of extraction. Remember that oil sands companies were given an extravagant tax breaks in the construction phase of development. I feel that the conclusion one would draw from this article is that capitalism is economic failure for citizens while state ownership and management of all natural resources should be the goal for an equitable society. Socialism equals a prosperous, healthier, and happier society. Unfortunately, the USA has become the military police state model of capitalism. Laws trump humanity in the USA. So many nations have chosen to follow the USA model of international corporate exploitation of natural resources with the benefits going to shareholders, not citizens. This capitalism and corporate control will ultimately fail as resources are depleted and populations of animals and humans will both crash…..as we are now seeing in the oceans with fish stocks…..
OK, let’s get some REAL facts straight here. 4) The Author is focusing on Alberta, and Alberta’s Heritage fund. Just a reminder, Alberta is a province, and is still bigger than the country the Author is trying to compare it to. 6) Forget trying to find a place to live in Norway, let alone be able to afford to buy a house. no multilingual problems,no aboriginal problems,no equalization problems !! We always have 10 provinces and 3 territories with their hand out and one of the biggest geographical territories in the world to Govern . They have a small border and few military costs. . The cost of living is so high that a large group of seniors actually go to Spain to live as their pensions go far. They only come home for health care and to die . Nice place but I am not moving there. Not a good comparison- Norway is the size, in population, of Alberta. If Albertans were able to keep all the revenue they generated with oil, they would be flush with money also.